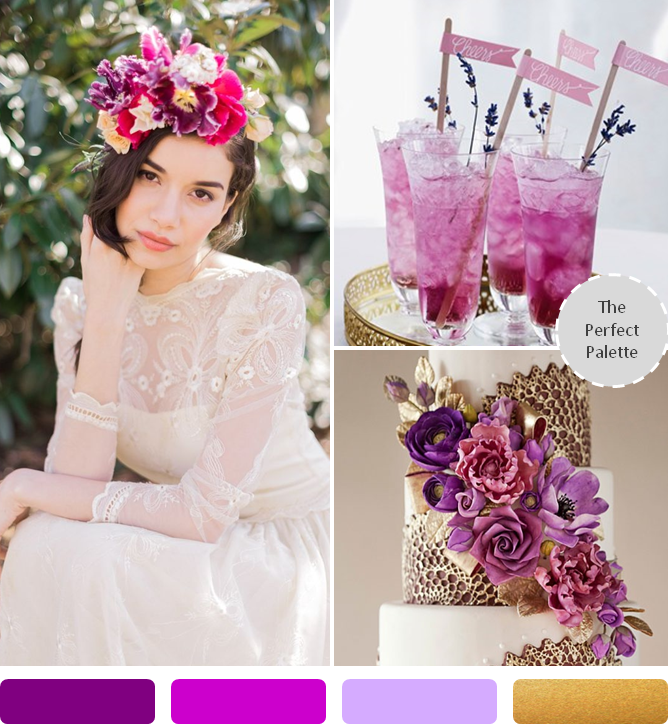 Wondering what colors will be hot for Fall weddings this year? Well, get excited because today is the day that I unveil the Top 10 Wedding Colors for Fall! Now, if you've been following my blog for any length of time then you probably know that I publish a couple of Top 10 lists each year which consist of the most popular and sought after colors of the season. So today I thought what better day to announce the top 10 wedding colors for Fall, 2014 than now? I know, I know, it's almost too exciting for words. So without further ado, here's your Top 10 Wedding Colors for Fall, 2014 (chosen by yours truly). Now if you've been engaged for a while or if you're a wedding pro of any kind than you probably have been witness to the soft and sultry shades that have been sweeping the industry. And oh, what beautiful shades they are! But this season, we're going to see couples gravitate toward the deeper, more pigmented shades like Cranberry and Bronze. Cranberry is big color for 2014. And I'm hoping you can see why? It's rich, and elegant, and just the sort of color perfect for your upcoming Autumn soiree. Looking for an equally rich hue to pair it with? Why not consider a mix of Mustard and Camel or even color like Light Sage. Both gorgeous colors that we'll be seeing a lot more of in the new year! Sage tones are also going to be hot for 2014. And it's pretty easy to see why! Shades of green make the prettiest of palettes. Earthy, cozy, and oh-so chic, I can't wait to see the many, many ways that couples end up using this gorgeous shade! Oh, and guess what, guys? A couple of shades of blue made it into the Top 10 this year including Navy Blue and Teal. Blue tones have always been and will always be top color for weddings, but I think this year we're going to see some more interesting shade pairings which of course I'm loving. These colors work so nicely with the nautical themes, but they can surely work in other settings as well. I love this jewel inspired look! Navy blue on the other hand works so well if you're going for a preppy, sophisticated look. I love the look of navy blue bridesmaid dresses! So flattering if you ask me! And these dresses are absolutely stunning. Try pairing navy blue with white, gray, or even green. When it comes to neutrals, we will surely continue to see a turn away from the traditional black and white. And instead, we'll see brides and grooms opt for some more original choices. Like Bronze for example. Bronze is such a warm, and interesting color. And it pairs so well with other top colors like blush and rose gold. I mentioned that there is this move away from white as a neutral and this still proves true for today's couple. We're seeing people embrace neutrals like this Camel shade and even it's associated tones like Beige and ivory. And it's pretty easy to see why. These creamy beige tones sure do add a touch of elegance. Rounding out this year's Top 10 Wedding Colors for Fall, 2014, we have some pretty warm shades like Pumpkin and Mustard! Of course I'm a bit partial to these shades because they truly do compliment the season so well! Try pairing these warm and spicy shades with muted colors like grayed jade for example. Mustard is a color that works so nicely for Autumn. It's rich, it's sophisticated and it's totally the sort of color that compliments the season. I like to see colors like mustard paired with soft shades like ivory or even softer shades of yellow. And last but not least, I can't go without mentioning the fact that there's two shades of purple in the top 10 list. Starting off with this muted Mauve shade! Keep your eyes peeled for more of this hue this Fall. It's a shade that is increasing in popularity and I think it's soft undertones will work beautiful for the season! And in contrast, is this vibrant shade of purple called Sangria. This year we surely saw a big influx of popularity when it comes to all things purple, thanks to Pantone's choice of Radiant Orchid as this year's Color of the Year. And while the purple tones will surely continue to increase in popularity, Sangria will be a front runner for sure! So be prepared to see Sangria pop up a bit more this Fall! So what do you think about the Top 10? Did any of your favorites make the cut? Or maybe there were a few colors you thought should have been included? I'd love to hear your thoughts and ideas! Oh, and if you're still on the fence about your wedding colors, be sure to read my Top 10 Wedding Color Mistakes and Ways to Avoid them. I promise you, it's super helpful! 15 Comments " TOP 10 WEDDING COLORS FOR FALL 2014 "
Loving that bronze board, OMG! Nice tips! Loved the Teal and also the Sangria theme. Gorgeous!! I love the cranberry, sage, teal, bronze, camel and mauve so much!! Exciting colour inspiration! I honestly think fall colors are the prettiest. Love these choices! Love the first two! Such great colors for fall!! So much color inspiration to adore! The bronze board is utterly gorgeous and I'm loving the idea of cranberry for fall! All gorgeous choices for fall. Have to say that cranberry is my favorite! Love your picks! As always! This inspiration is absolutely lovely! Can anyone tell me where these shoes are from?? They would be perfect for my wedding day! Ahh sangria - definitely the best! So excited for these colors! Loving teal, cranberry, bronze and camel - and really all the rest! I love summer, but you now have me a little more enthusiastic about fall! So many gorgeous shades–I don't know if I could choose just one! Luckily, they go beautifully together, too!